Cut paper twist for pedals, into 1 yard lengths. Using pinking sheers, cut the 1 yard lengths into the falling, 4 pieces 2 1/2″ long, 4 pieces 3″ long and 4 pieces 3 1/2″ long. Cut the hard wire into 6″ pieces to make the stems. Untwist pre-cut pieces of paper twist. (Petals) Place a small bead of glue along the bottom edge of a 2 1/2″ piece. Wrap the glued edge around a 6″ piece of hard wire, be sure that the hard wire (stem) is not showing above the top of the flower. Continue in the same fashion with the 3 remaining of 2 1/2″ paper twist. Please note that several pleats should be placed in each petal as your wrap it around the steam. Starting 1/2″ lower on the stem begin gluing and pleating the 3″ pieces of paper twist. The same approach should be used for the 3 1/2″ pieces of paper twist starting 1/2″ below the 3″ pieces. Wrap floral wire very tightly around the flower about 1 inch form the bottom of the 3 1/2″ petals. Cover the wire with floral tape. Fluff the flower and trim uneven petals with pinking sheers. Cut green paper twist into 6″ lengths. Untwist each 6″ piece. Cut several thin leaves about 2 1/2″ to 3″ long. Glue these to the stem and curl the ends slightly. 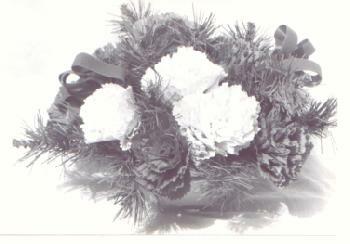 Place styrofoam in a basket, vase or pot and arrange finished carnations.